Telephone support available from Monday to Friday from 9am to 6pm. We answer to all your requests within two working days. Via our chat, we answer all your questions. Available from Monday to Friday from 9am to 6pm. Visa, Mastercard and American Express are accepted to place your order. PayPal is a very safe and easy way to pay. You can use your credit card or bank account without exposing your account numbers. PEOPEO bank details will be provided upon confirmation of your order. Please use the identifier of your order as a reference during the payment. After making your transfer, it may take 2 to 3 working days for your bank to complete the transaction. We will ship your order as soon as we receive your payment. Any incident of payment authorizes us to refuse the order or block the delivery. The order will be shipped after PEOPEO received the payment from the customer. The amount of shipping costs depends on your order and the country of delivery. It is possible to pick up your order for free at PEOPEO factory. Please note, if you are away, you will have to collect your order at a post office. In case of after-sale service, returns are free. We do our best to deliver your order within 1-2 weeks. We manufacture our product in our factory in Meylan (38). We do our best to meet delivery deadlines. In times of high demand, shipping may be delayed. PEOPEO products are delivered in a packaging containing protective foams. We recommend keeping all of these elements. In case of a possible return, your products need to be properly packaged and protected. From an ethical point of view, keeping and reusing your packaging avoids unnecessary waste. Try your PEOPEO products at home for 30 days. If you have a problem or are not happy with any PEOPEO products, please send us an email [email protected] We are available to assist you. You have a period of fourteen (14) days from the notification by mail of your intention to retract to return the products by post to the following address: PEOPEO, 19 Chemin des Prés – 38240 Meylan – FRANCE. We will not be held responsible and will not make any refund in case of loss or theft of the package containing the return products. It is strongly recommended to opt for a shipment with delivery tracking and insurance against loss and theft. The costs incurred by the delivery of products to return are your responsibility. To be refunded, the products must be returned in a condition and packaging that can reasonably be expected. You are only allowed to test products without intensive use. Your products have to be accompanied by their purchase invoice or a copy of the invoice in case of partial return. Once your return has been received and reviewed, we will confirm (or reject) your acceptance and your refund will be made. The procedure should not take more than two weeks. Please note that depending on your financial institution it may take additional working days for the credit to show in your account. Your products are covered by a limited warranty. The warranty is valid only on PEOPEO speakers. Content of the commercial warranty: PEOPEO guarantees your product free of charge against any failure, any defect (including defects in material and workmanship) and any malfunction of your product. This warranty applies only to the original purchaser or the person receiving the product as a gift and may not be extended to any other subsequent beneficiary. If any breakdown, defect or malfunction appearing on your product during the period of the guarantee, PEOPEO engages automatically and without any expenses for the customer to (at the choice of PEOPEO): 1 / to repair the product 2 / to replace the product 3 / to refund the purchase price of the product in exchange for the return of product. Time of the commercial warranty: The speaker’s warranty is valid only for a period of two (2) years from the date of the delivery. Terms and deadlines for implementing the commercial guarantee: The customer must to contact PEOPEO customer service by email [email protected] or by phone +33(0)7 67 20 22 79. Before providing a warranty service, PEOPEO may request to provide proof of purchase including a receipt or invoice. The commercial warranty will not apply if the serial number has been removed from the product. Warranty disclaimer: PEOPEO’s commercial warranty does not cover damage to the product that results from normal wear and tear of the product, operating fault, improper use of the product, improper maintenance of the product, or damage to the product, accidental breakage. Any unauthorized intervention on the product by the customer, disassembly, modification, personalization or a repair performed by anyone other than PEOPEO will void the commercial warranty. PEOPEO is bound by the guarantee by reason of the hidden defects of the product sold which render it unsuitable for the use. Any request made by yourself under the legal guarantee of conformity or the hidden defects guarantee must be sent to the following address: PEOPEO, 19 Chemin des Prés – 38240 Meylan – FRANCE. PEOPEO is bound for the lack of conformity of the products sold under the conditions set out in Articles L.211-4 and following of the Consumer Code as well as hidden defects under the conditions provided for in articles 1641 and following of the Civil Code. During this time, you have a presumption of lack of conformity. Accordingly, PEOPEO has to prove the product’s conformity. You can choose between the repair or the replacement of the product, subject to the conditions of cost envisaged by the article L.211-9 of the Code of the consumption. You can decide to implement the guarantee against hidden defects within the meaning of Article 1641 of the Civil Code. In this case, you can choose between the resolution of the sale or a reduction of the selling price in accordance with article 1644 of the Civil Code. WHAT TYPES OF DEVICE ARE COMPATIBLE? All audio sources regardless of the tool. The VOODOO has a Bluetooth input for all equipped devices (phone, computers, tablets…) and also a mini jack input for wired connections. DOES THE VOODOO RESIST COLD? In cold and hot, The VOODOO is strong (-15 ° c / 50 ° c)! CAN I USE THE VOODOO AT HOME, CONNECTED TO THE ELECTRICITY GRID? Of course, it’s like your laptop! You can use it connected, charging and of course on battery. CAN I SWIM WITH THE VOODOO? WHAT IS THE CHARGING TIME OF THE VOODOO? From 0% to 100% it will take 2h30. IS IT BETTER TO STORE THE VOODOO FULLY CHARGED OR COMPLETELY DISCHARGED? We recommend you to store it fully charged to extend its battery life. IS IT POSSIBLE TO CONNECT AN INSTRUMENT ON THE VOODOO? 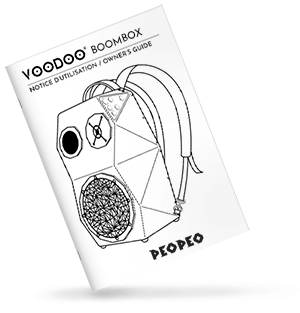 The VOODOO has a built-in pre-amp allowing you to use any type of musical instrument. It is possible to connect a guitar, a mixer or a controler for DJs, a microphone, any type of unamplified instrument. 15H AUTONOMY AVERAGE OK, BUT HOW MUCH IS IT A MAXIMUM VOLUME? Indeed at full power consumption is a little more important. You will nevertheless 12H thoroughly! Aslo when you charge your device your use Bluetooth it can affect a bit the autonomy. IS THERE ANY BREAK-IN PERIOD ON THE VOODOO? The break-in is done automatically during the first 24 hours of listening at medium volume without any specific manipulation. This is okay, the speaker is at its maximum volume and tells you that the antisaturator starts to not damage the sound and components. IS IT POSSIBLE TO CONNECT A VOODOO SPEAKER WITH ANOTHER AUDIO SYSTEM? Yes it is possible via mini-jack cable, however connect them in Bluetooth will not work. IS IT POSSIBLE TO CONNECT ANOTHER CHARGER TO MY ENCLOSURE? No because the chargers used are specific. Using other equipment may damage your speaker and void the warranty. WHEN MY SPEAKER WORKS IN THE DARK, I DETECT A RED LIGHT WHICH FLASHES INSIDE. Do not panic, this light shows the heart of the VOODOO loudspeaker is working properly! CAN I CHANGE THE GRID OR BANDS OF MY ENCLOSURE? It is forbidden to change an element of your speaker by yourself. This could cause malfunction, breakage and void any warranty. IS IT POSSIBLE TO CONNECT A USB KEY TO MY SPEAKER? The USB port can charge your mobile devices only. I CAN NOT FIND OWNER’S GUIDE, HOW TO DO IT? 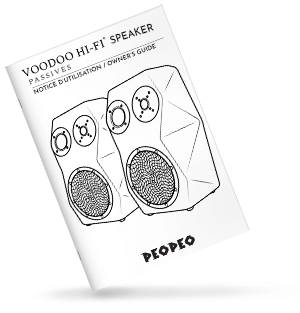 You can download the owner’s guide of your speaker by clicking on this link. MY SPEAKER PRODUCES HEAT, IS IT NORMAL? heat you can feel from the touch of your speaker is generated by the power amplifier. I HEAR A BUZZ WHEN THE SPEAKER IS CHARGING AT MAXIMUM VOLUME, THE SOURCE CONNECTED BUT WITHOUT MUSIC. We recommend you to set the source to 3/4 of its maximum volume and then set it to the speaker. Once the volume is right for you, you can use the source to adjust it. WHY NO SOUNDS COME OUT WHEN I CONNECT MY DEVICE TO MY SPEAKER? To activate the volume it is necessary to press the + button of the speaker interface. We offer a two-year warranty from the date of receipt.